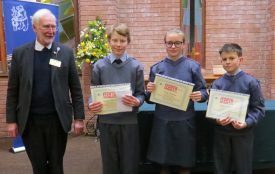 February 8th saw Northgate Methodist Church in Warwick host the annual “Youth Speaks” competition organised by the Rotary Clubs of Warwick, Warwick Avon, and Southam 2000, to give local young people a chance to demonstrate their public speaking skills. This year 21 young people competed in teams from Myton School (2), Warwick School (1), Kings High School (2), Warwick Air Cadets (1) and Princethorpe College. 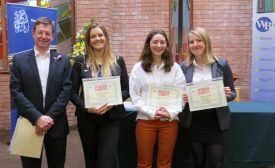 Teams competed in 2 classes; – Intermediates (11 -13) and Seniors (14 -17), with prizes going to the winning team, and an opportunity to compete in the West Midlands regional competition. In past years Warwick teams have even reached the National Finals. Each team of three members had 12 minutes to present the case for a topic of their choosing which ranged from “Modern Air Power” to “Should the world go Vegetarian?” This annual event gives young people a chance to voice their opinions on topics they feel strongly about and demands significant research, knowledge and the confidence to present arguments clearly and concisely. The contestants were judged by an experienced panel well steeped in the mystical art of public speaking. 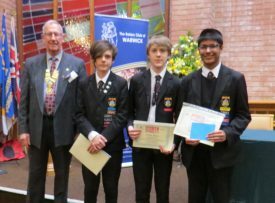 The event was hosted by the Vice- President of the Rotary Club of Warwick, David Smith; Southam 2000 President John Dugmore; and Warwick Avon President Roger Buckle, and attended by Warwick Mayor Cllr Stephen Cross, parents and colleagues. 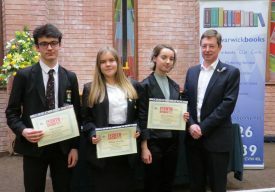 The Intermediate class was won by a team from Myton School which discussed “Who Cares” and the impact on the thousands of children acting as Young Carers. They were presented with certificates by Southam President John Dugmore. 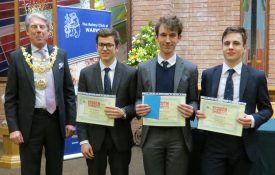 The Senior class was won by a team from Warwick School which discussed “What it means to be British” They are shown receiving their awards from Warwick Mayor Stephen Cross. 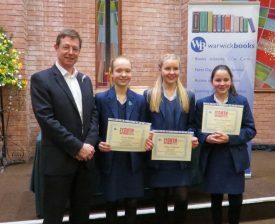 Winners and runner up teams received book tokens from Warwick Books which supported the event, and all contestants received a Certificate of Participation for their Achievement Folders. Both winning teams will go forward to the Regional Finals held in March. with Southam President John Dugmore. Warwick Mayor, Cllr Stephen Cross. The team were Jo Danter, Michael Cox and Tom Park.